DONETSK, Ukraine -- Yevdokiya was still a young girl, her nephew recalled, when the neighbors invited her over for a social occasion of some sort. 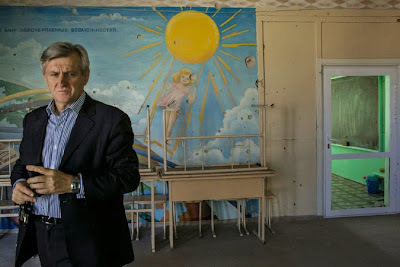 Igor V. Kostenok, the education minister of the Donetsk People's Republic, said that the intention of the new curriculum was to highlight the region’s long ties with Russia and weed out Ukrainian nationalist ideas. This was during the great famine of 1933, he said, and her family became alarmed when she failed to return. She never did come home, said the nephew, Aleksandr S. Khodakovsky, now a senior official in the Russian-backed separatist government of the Donetsk People’s Republic. To their horror, her parents discovered that she had been cannibalized by the desperate neighbors, not an uncommon occurrence in a famine that killed 3.3 million people, by most estimates. Traditionally, Ukrainian historians have characterized the famine as a genocide, the direct result of Stalin’s forced collectivization and the Soviet government’s requisitioning of grain for export abroad, leaving Ukraine short — and its borders sealed shut. Since Ukraine gained independence, that is what its students have been taught. But that is not what students in southeastern Ukraine are learning this year. Instead, under orders from the newly installed separatist governments, they are getting the sanitized Russian version, in which the famine was an unavoidable tragedy that befell the entire Soviet Union. Even Mr. Khodakovsky, whose aunt’s remains were later found in a well, has trouble accepting that line in its entirety. “It was terrible,” he said of the famine, and not at all unavoidable. Rather, he said, it was the result of Stalinist policies, particularly the sale of grain to finance industrialization. Ukraine’s 20th-century history is steeped in blood. After the famine, the country took the brunt of Stalinist-era repression and the violence of the eastern front in World War II, when upward of five million Ukrainian civilians died. In the current civil war, aside from the control of territory, nothing has been so fought over as this history. Natalia S. Skrichenko, a history teacher, has been watching that process unfold all around her. Soon after the separatists took over, Ms. Skrichenko and other history teachers in separatist-held areas of eastern Ukraine were told to throw their existing Ukrainian history texts into the trash. “History doesn’t change,” Ms. Skrichenko said philosophically about the new curriculum for students in rebel-held portions of Ukraine. At School No. 14 in Donetsk where she teaches, students are being taught jarringly different lessons about some of their country’s darkest and most contentious periods in the 20th century. They include not just the famine, but dealings with the Nazis, the Stalinist repression and relations with Russia. And history is hardly academic these days in Donetsk. Russia and the groups it has supported in eastern Ukraine have justified their uprising, which has led to the deaths of more than 6,100 people and the displacement of about 1.5 million, by calling the revolution that ousted the former President Viktor F. Yanukovych a neo-fascist coup. A main problem is the excessive note taking, as there are no textbooks, complained Polina Zyagina, who is in ninth grade. “There’s no sense in studying the history of Ukraine any longer,” she said. “It’s an idea about socialization, about creating a culture, a culture for the Slavic world, for the Russian world,” he said in an interview. The students will not be taught a Ukrainian identity, he said. It details dozens of topics teachers should touch upon from the 1930s. One is cheerily titled, “the accomplishments of the coal and metal industries” in the interwar period, when a Stalinist project of forced industrialization was backed by a terrorist campaign. Another makes sure teachers bring up the “final liquidation of adult illiteracy” under Stalin in Ukraine. That seems short shrift for a searing, blood-chilling depopulation of the countryside that sent crowds of stick-figure-thin peasants into the cities to beg and die by the thousands in the spring of 1933. Mr. Khodakovsky’s family on his mother’s side dealt with the cannibalization of Yevdokiya and other hardships by remaining secretly religious through the Soviet period. “It’s God sending us these tests,” he said. He was not, in any case, raised to hate the Russians, and has relatives living in Moscow. The excessive grain requisitioning was a Soviet atrocity, not a Russian one. “My mother never blamed anybody,” he said.